Do you think decorating your home is a waste of time? Have you ever heard that Valentine's Day is just a Hallmark holiday? I don't believe either of those things. 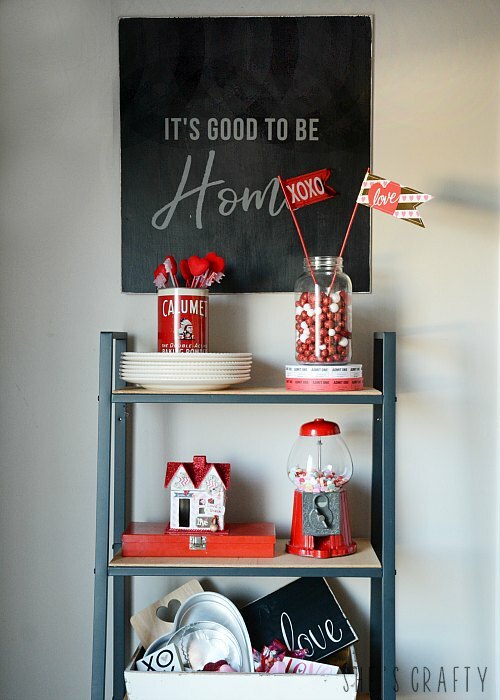 Today I'm sharing Valentine Vignettes from around my home and why I believe that you should decorate your home for you and your family! I've said it before and I'll say it a million times, I think it's so fun to celebrate any and all holidays! And I celebrate by decorating my home for all of the holidays, both big and small! Valentine's Day is a favorite of mine! I love L O V E! 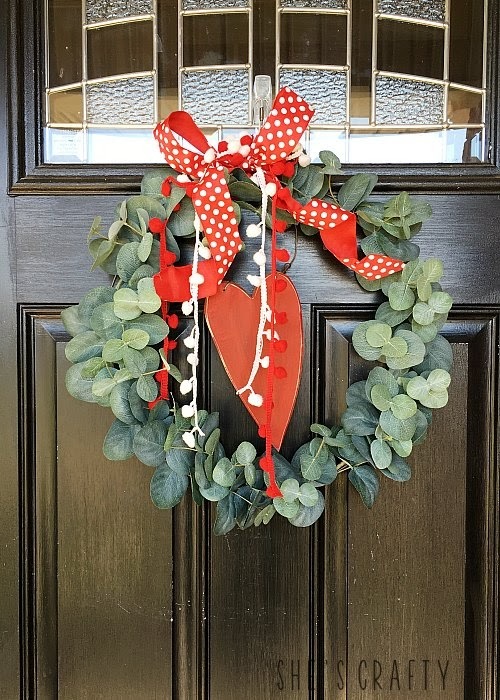 I've added pops of red and hearts all around my home- starting at the front door with a Hearth and Hand Eucalyptus Wreath embellished with a wooden heart and ribbons. Crafting a comfortable, enjoyable and relaxing home with charming holiday touches are one of the ways that I take care of my family. And the bonus of that is being creative while doing so gives me joy! 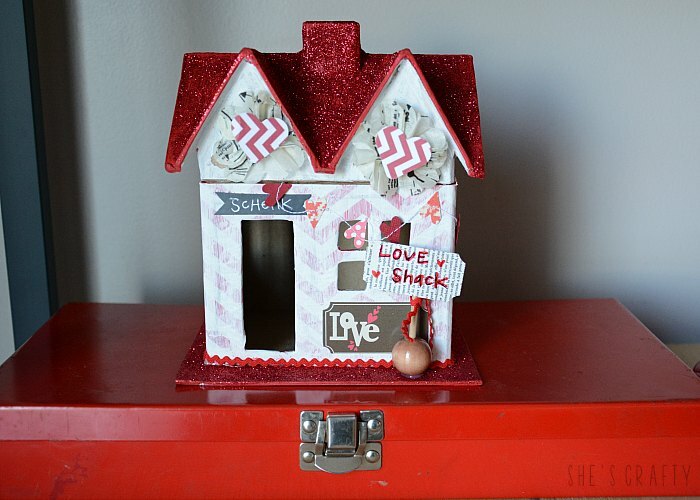 I love to make decor items to display in my home such as a paper mache' house decorated as a Love Shack! 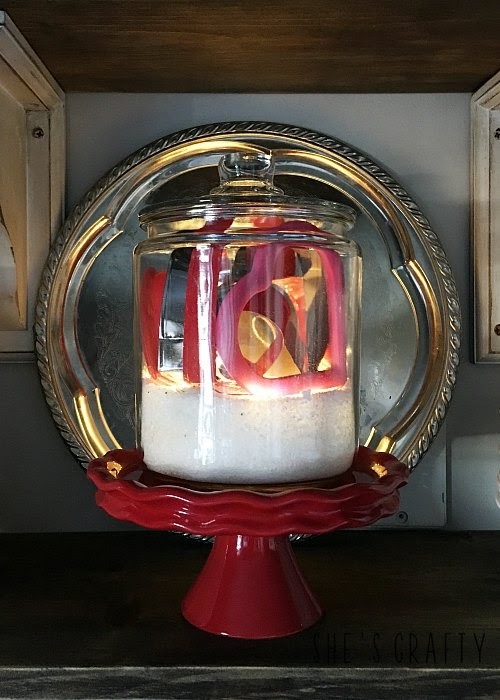 Using beloved treasures around our home, like this vintage gumball machine, that have been handed down from family or that I've collected over the years brings me tons of joy! I also like to use my collections, like metal cookie cutters, displayed in new and unique ways. Either gathered into vases with colored rice or gathered in a jar with lights. 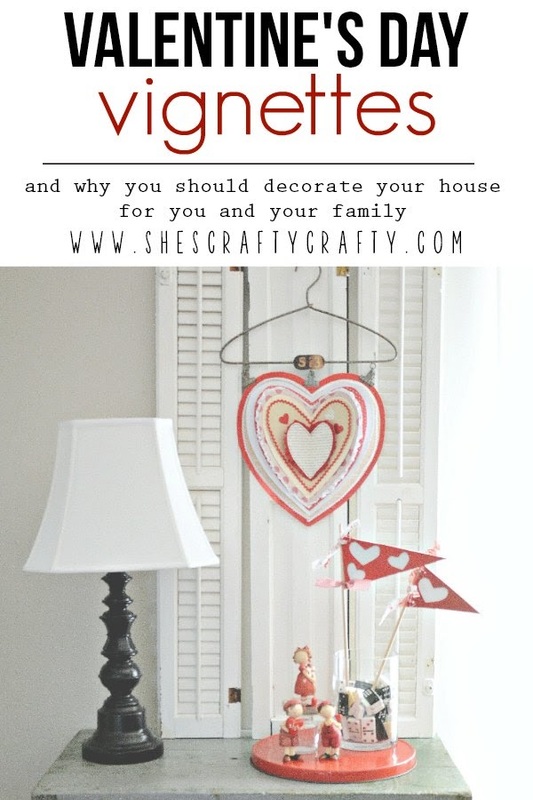 It's my favorite when I can go into my craft room and create something for my home! 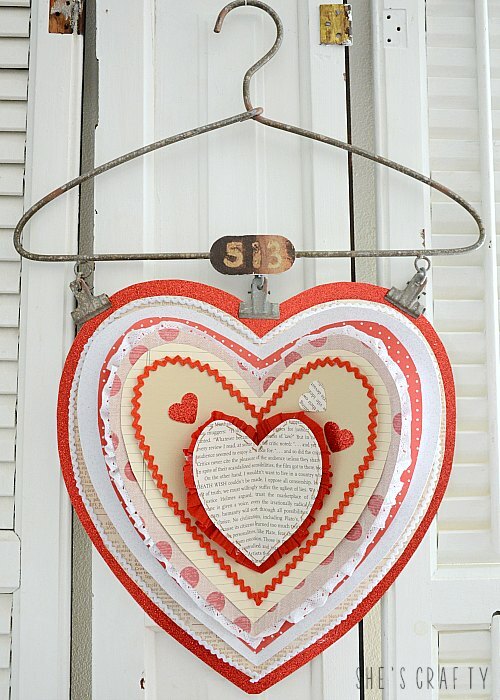 I created this Valentine concentric heart art by hand cutting hearts from various patterned papers and hot gluing various trims to the edges. I was going for an old school Valentine look. I hung the piece from a hanger. The Valentine resin figures were purchased around 10 years ago to represent my children. 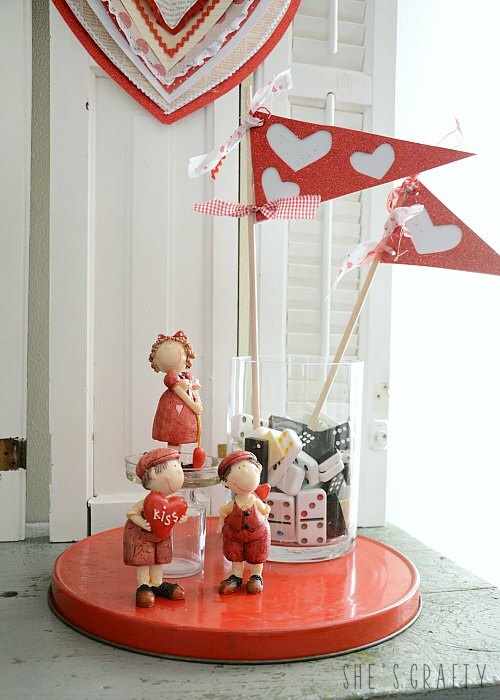 They are so charming in this display with a jar of game pieces and flags hand cut from fun foam and tied to a dowel! The red tray is the top of an old popcorn tin. So why should you decorate with you and your family in mind? Creating a home full of love and joy by displaying mementos of shared experiences adds richness to life. Your home houses the most important people in the world! It is not vain to to create a haven for those people! It's not showing off! It's showing up as the best you and crafting a life you choose to live! 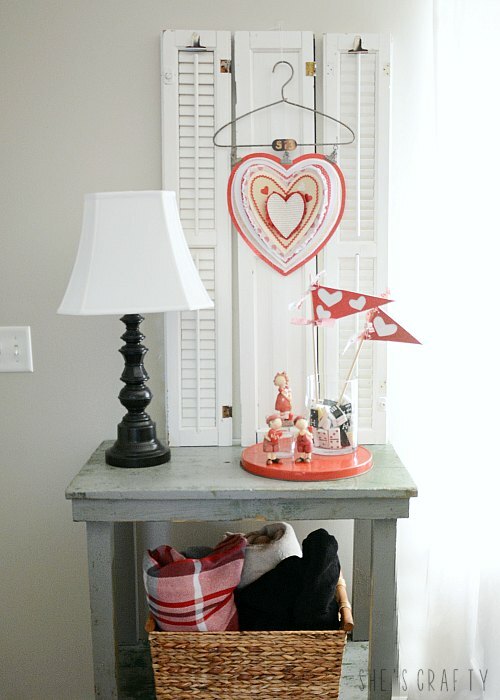 Decorate your home the way you want with the things you love! Hi Julie! 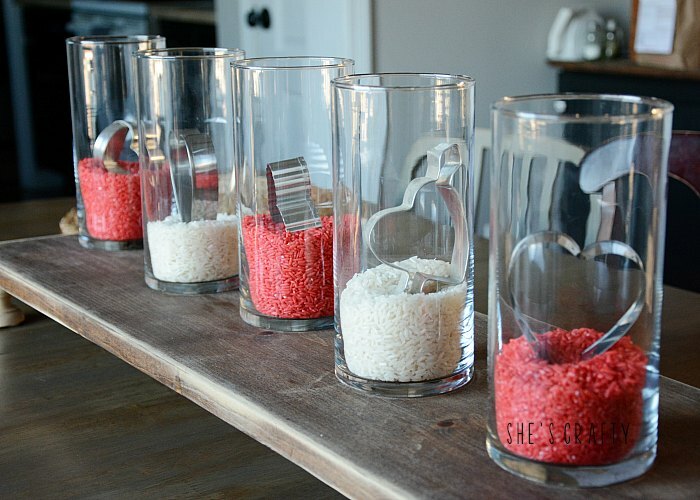 I dyed the rice by putting red food coloring onto a few cups of rice and then sprinkled vinegar over it. I spread it out onto a cookie sheet and let it dry over night. Worked like a charm! I love all of your vignettes - particularly the cookie cutters. So clever! I also love the wreath on the door. 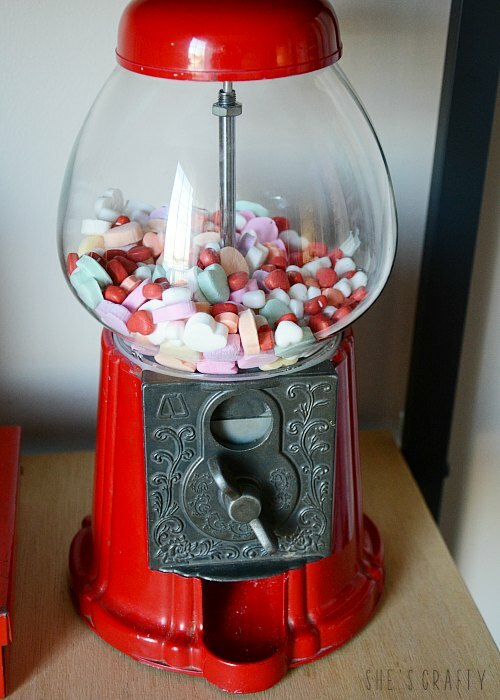 And my parents have one a vintage gumball machine on a stand. So much fun! Thanks for sharing at Sweet Inspiration! Thanks so much Amy! I was so happy to find a way to display my cookie cutter collection! Have a great day! Goodness what adorable vignettes! (The gumball one though is my fave) :) Thanks for sharing at "Sweet Inspiration"! Thanks so much Lidia! Have a great day! I couldn't agree more with your ideas about decorating for holidays. We don't even have children, but yet I decorate for each holiday. It just makes me happy! Thanks for sharing your vignettes.